We will provide guidance regarding your pet's nutritional needs for each life stage including growth, weight maintenance, and weight loss. We have also implemented a weight monitoring system for those pets that are over or underweight. We want them to be healthy and happy while being with you the maximum amount of time possible. Calculating how many calories your pet needs can be a very daunting task with all the options available to you. We can help you get started by measuring your pet's food and making sure their nutritional needs are met. Just like us, not every pet is the same - which means these amounts are just a starting point. Some dogs can be the same age but have very different activity levels, and some cats grow into their senior years needing more food than as an adult. Did you know that nursing animals need approximately three times the amount of food than usual? But it's not just the amount of food, it's the quality of nutrition that also matters. 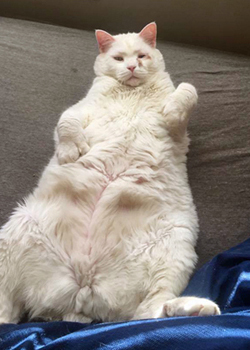 We need to monitor your pet's weight regularly if they're having any issues. You may stop by any time we're open and we will weigh your pet - there is no charge and no appointment is needed. If you have any doubts of what, or how much, to feed your pet we're here to help. Our first recommendation, of course, is no people food and not too many treats. It's not just about high calories! For instance, animals that have kidney issues shouldn't be eating a lot of sodium - the kidneys won't be able to eliminate excess sodium and fluid, which can cause discomfort and increase blood pressure. If we notice any possible problems during the exam we'll go over your pet's diet with you. We'll help you narrow the choices you have and pick a satisfactory diet for your beloved family member. 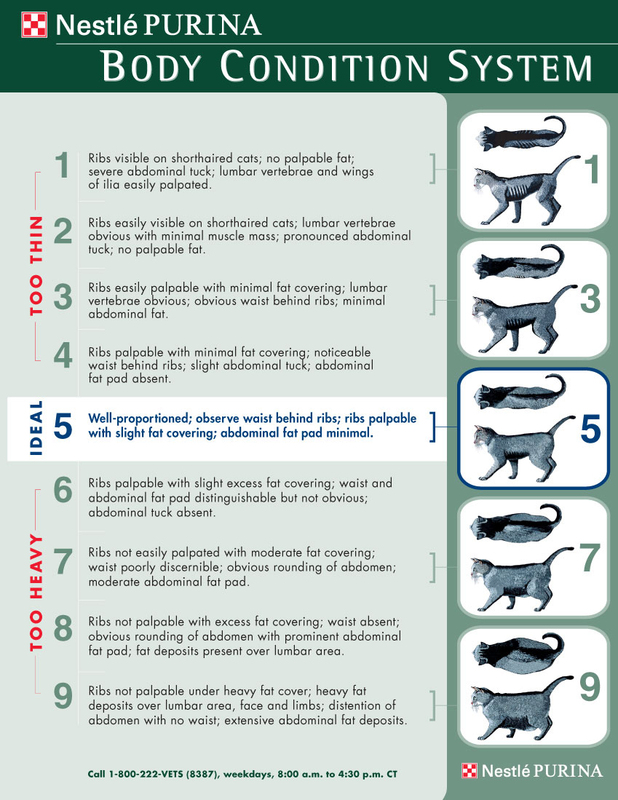 Below you can see the body condition scoring system for dogs and cats. 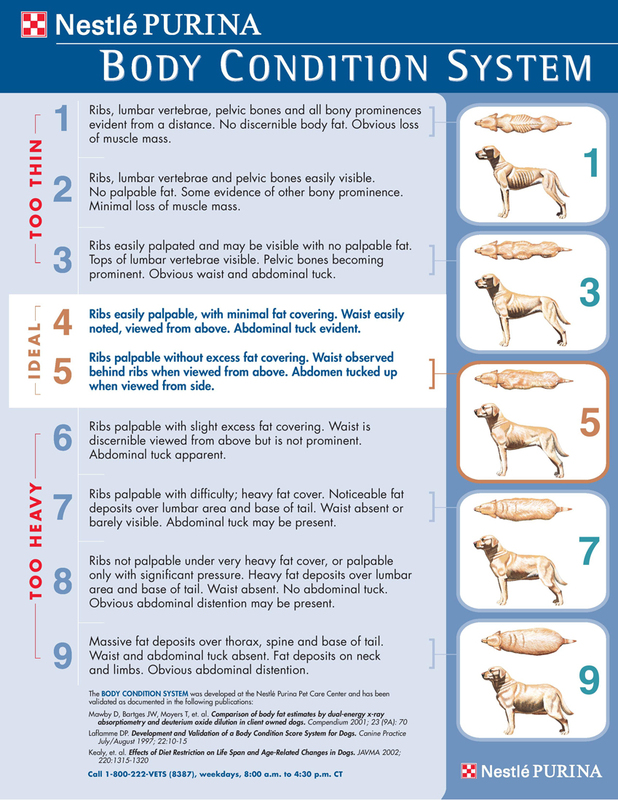 These cards show the 0 to 9 scale using only odd numbers, however, some veterinarians (like us) use the same scale, but as 1 to 5.